Published January 14, 2014 at 187 × 300 in Thailand. Manao was born on April 21, 2005. 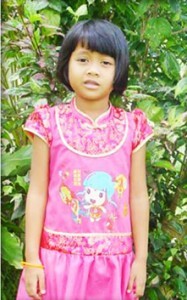 Manao (literally meaning “lime”) was abandoned by her parents when she was only three months old. She was given to an elderly woman, who later passed away when Manao was 3 years old. She will now be attending Year 1 in primary school.